My day job may be looking at planets light-years away orbiting other stars but I am still inspired by the majesty of our own solar system and its seemingly effortless elegance. 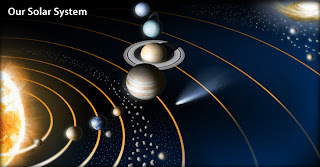 The solar system is a beautiful array of planets, starting with the inner solar system and its small rocky worlds out to the large gaseous planets of the outer solar system and the bodies that lie in the dark beyond. The terrestrial planets alone display an array of qualities, Mercury and the break down on Newtonian mechanics, Venus and the runaway greenhouse effect, Earth and the origins of life and, Mars with its depleted atmosphere and its giant mountain ranges. The asteroid belt marks the region between the inner and outer planets where the gravity between the Sun and Jupiter prevent the build-up of a planetary body. The Giant planets are large gaseous worlds orbiting the Sun at over 5 times the distance of the Earth. The first is Jupiter the largest of the Giants, rightfully names the king of the gods, you could fit the earth inside it more than 1000 times. The next out is Saturn with its vast ring system that spans over 200 thousand km but are less than a football goal wide. Leaving Uranus, which barrel roles around the sun, and Neptune with winds that can reach around 2,000 kilometres per hour orbiting at over 20 times the distance from the Earth to the Sun. Five out of the seven planets in our solar system can be observed from Earth with the naked eye, their orbits carving paths through the constellations since they were first observed millennia ago. It was not until the development of the telescope in the 17th century that the ability to observe fainter objects in the night sky was realised. In the spring of 1781 Sir William Herschel turned his telescope to the sky to continue his search for binary stars when he observed an object unlike any others he had been observing. Herschel made many more observations of the object and carefully documented its movement asserting them to be of a comet like body. After presenting his findings to the Royal Society and notifying the Astronomer Royal, a number of other astronomers started to suspect that the object was not a comet but a planet. With the help of Anders Lexell, a Russian astronomer and mathematician, the orbit of the object was calculated revealing it to be nearly circular occupying a space beyond that of Saturn. It was in 1783 that William Herschel presented the discovery of a 'new primary planet of the solar system' to the Royal Society, with the proposal to name it 'Georgium Sidus' after King George the third. This name, however, did not catch on outside of Britain and in 1850, 28 years after Herschel's death, the Planet was universally known as Uranus. The discovery of Neptune is a slightly different story. After many observations of Uranus and careful monitoring of its orbit it was hypothesised that there was an unknown gravitational body perturbing (making slight changes to) its orbit. In 1845 independent of each other, two mathematicians, John Crouch Adams and Urbain Le Verrier, developed calculations estimating the position and mass of this new planet. Adams was a quiet unambitious mathematician from Cornwall and although his calculations were not taken seriously until after the observations of Neptune were made in 1846 by the Berlin observatory working from Le Verrier’s calculations, was content to share the credit of discovery with Le Verrier. In 1998, however, it was determined that the credit solely belongs to the person who calculated and obtained the observations giving the credit to Le Verrier. The solar system we live is still in some ways a mystery to us and the ability to understand it is still a very important scientific goal and although I am now observing exoplanets and trying to understand their dynamic atmospheres I always think back to what we can learn from our own back yard.